William Edward Johnson was a Conscientious Objector from Dunham Massey in Cheshire. In the lead up to the outbreak of war William considered officially joining the Society of Friends, but was concerned that it would seem he was “taking shelter” with a well known anti-war group - a worry shared by many other Conscientious Objectors. 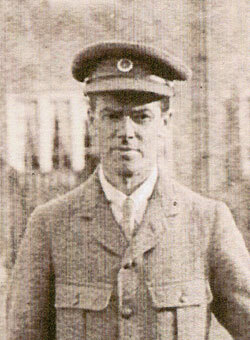 William argued strongly for his right to object to war at his Tribunal hearing in mid 1916 and was successful in securing work with the Friends’ War Victims Relief Committee as an alternative to military service. The FWVR was not just an aid organisation that secured housing, food, medical supplies and training for the many millions of war victims around Europe (and beyond) in the First World War, but was also dedicated to enacting social change - in the words of one commentator it had “from the first a strong Utopian strain”. By February 1917, William was working abroad organising food and weather relief for a small village in the North of France. This vital relief work continued until December 1918 when he left the country to return home. By becoming a CO, William ensured that he could help some of the most neglected victims of the First World War; refugees, children and the thousands of civilians that fell ill in the wake of the devastating conflict. He resisted war by making a conscious choice to provide aid and save lives, rather than fight to take them. Two of his five children, Ken and Brenda, would follow in William’s footsteps and work for the Friends’ Relief Service in the Second World War.